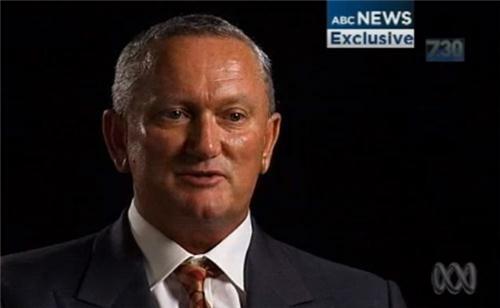 Former Essendon employee, Stephen Dank, says the Australian Crime Commission personally told him he had done nothing wrong in regards to his supplement regime at the Bombers in 2012. The AFL and the Australian Sports Anti Doping Authority (ASADA) are investigating Essendon over what could be the use of banned substances by Bombers players in 2012. Speaking to the ABC's 7:30 Report on Monday night, Dank - who says he is a biochemist by trade - also said Essendon coaches and players were well aware of the details of the supplements program. Dank said Dean "The Weapon" Robinson, club coach James Hird and club doctor Bruce Reid were given plenty of deatails about the program he oversaw. 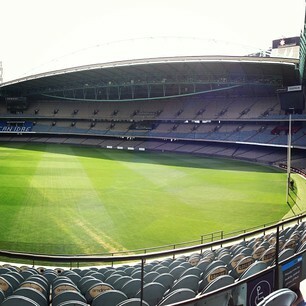 - Dank said he joined Essendon's ranks after being invited to work there by Dean "The Weapon" Robinson. - Dank says the supplements regime that was devised for Essendon players was detailed to players and coaches at the Bombers. "Coaches were well aware of wat was happening," said Dank. - Dank says he didn't work alone, and that James Hird and "The Weapon" were directly involved in the program being questioned. "There was a very significant involvement from Dean (The Weapon) .. there was always detailed discussion with James Hird and the club doctor." - Dank says he did nothing wrong while at Manly Sea Eagles in the NRL, where he said he oversaw a supplements program at the club. - Dank says he was asked to "put science" into Essendon's fitness program, which also involved a supplements program. - Dank said all Essendon players were asked to sign consent forms because they "were introducing a fairly broad-ranged type program" and he wanted players to be informed. - Dank says he is very, very surprised former Essendon players (like Kyle Reimers) say they didn't know what they were given. - Dank says he did not inject Essendon players with any prohibited substances and adds they were only injected with Vitamins A and B. Danks says no peptides were administered to Bomber players intravenously. - Dank says everything Essendon players were given conformed to the WADA code and every supplement administered was logged in an electronic register kept on Essendon's Intranet. - Dank says some Essendon coaches - who are not subjected to the WADA code - were taking vitamin supplements, protein supplements and some of these were outside the WADA code. Dank said there was nothing illegal about the substances used by "a couple of the coaches". - Dank was told by club management three days after Essendon's final game of the season that his contract would not be renewed. In September, the Australian Crime Commission interviewed Dank and told him "they didn't think he had done anything wrong". 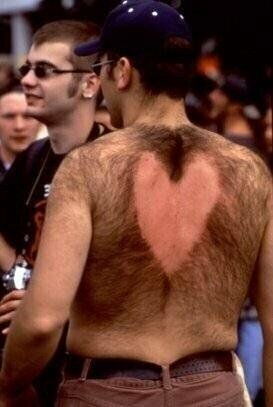 Meanwhile, new Essendon player Brendon Giddard urged fans to stick by the club earlier on Monday. "As a whole team we've really helped each other in certain situations, particularly the last week, in talking about what we need to do and control what we can control," Goddard said. "Understandably the players have been a bit anxious. It's really important for us as a playing group to move on." "At this point in time it's all allegations and at no point can you jump to conclusions. [For] supporters it's important to stick by the club because the boys are doing everything they can to prepare for another season of footy and it obviously starts on Friday night." Former All Australian Nathan Brown said he was offered, and considered taking, human growth hormone after he broke his leg when playing for Richmond in 2005. Garry Lyon On Triple M "Adrian Anderson left pretty abruptly just before Christmas at a time when most news people hope that things can be slipped through. That may warrant further investigation as well. I'm not suggesting for a second that Adrian's done anything wrong but as the man in charge of footy operations, as you said, it hasn't been a good year." Waiting on The Boss (Andrew, not Bruce) to update us on the AFLs position after today's Aussie sport bombshell. Fitzpatrick: all club officials to meet with AFL to discuss matters at hand. ALL clubs on notice to advise League of drugs used in clubs. AFL is investing in more people in its Integrity Department and instruct the league's medical commissioners to meet with club doctors. Demetriou: Every club will be audited. Demetriou: background of all club employees to be investigated across AFL. Each club's Chariman, CEO, Coach and Football Manager will have to come and have a yarn with us next week - Andrew Demetriou. RT @TripleMMelb "Demetriou: our sport is not immune...we take that very seriously' http://pbs.twimg.com/media/BCe_1qQCYAAGx52.jpg"
Andrew Demetriou: "Our sport is one of the two codes, along with the NRL, who needs to do more". Unfortunately cannot detail any breaches for us. Andrew Demetriou won't say if other clubs will be implicated other than Dons, but he says many footy people - at all clubs and at all levels within clubs - will have had a wake-up call. Andrew Demetriou's message to anyone daring to be involved in corruption "after today, make absolutely no mistake... you will be caught." Andrew Demetriou is bound by confidentiality on many things in ACC report; he even said he is "bound by confidentiality" twice. Andrew Demetriou: "There are drugs not even approved for human use (that are) being trialled"
Andrew Demetriou: "I'm not going to comment on the Essendon situation." 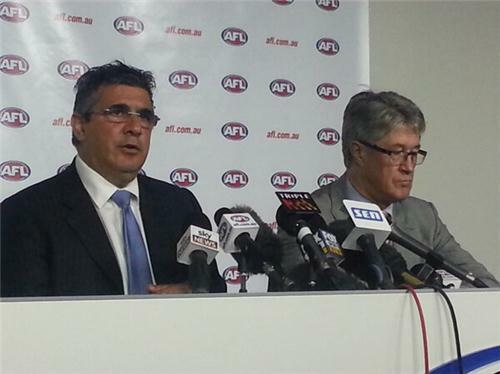 Andrew Demetriou says AFL commission has agreed to set up a whistleblower service for people to come forward. Finer details yet to be determined. Andrew Demetriou says that the AFL testing regime, as good as it is, is not enough. The criminals are ahead of us on some things. Andrew Demetriou: "I don't believe, ever, that you compromise the boundaries to win." Andrew Demetriou says the sport is much greater than any individual. He denies that if no player is penalised this year it highlights people are "getting away with it". 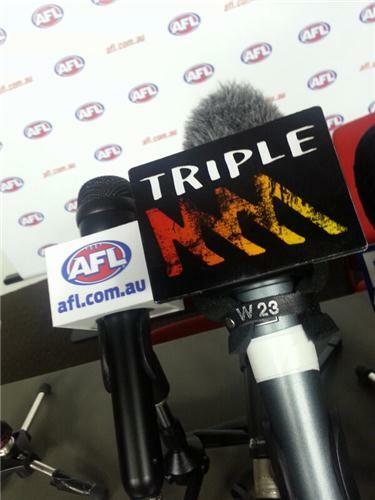 AFL Presser Wrap: Integrity Department to be beefed up (more staff, technology), background checks on all club staff. Criminal are ahead of the game and some drugs being used haven't even been cleared for human use. 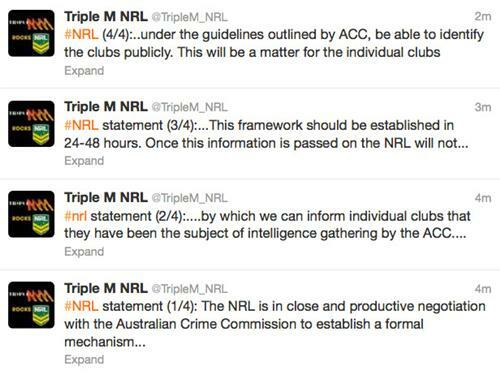 The NRL has now released a statement (via @TripleM_NRL on Twitter). “The NRL is in close and productive negotiation with the Australian Crime Commission to establish a formal mechanism by which we can inform individual clubs that they have been the subject of intelligence gathering by the ACC. “Tony Whitlam QC is today continuing to assist the NRL in establishing a formal set of procedures with the ACC through which information can be passed to the clubs. This framework should be established in 24-48 hours. “Once this information is passed on the NRL will not, under the guidelines outlined by the ACC, be able to identify the clubs publicly. This will be a matter for the individual clubs to consider in consultation with ASADA, the ACC and the NRL. “While acknowledging media speculation about the number of clubs today, the NRL remains bound by strict legal constraints and these have been reinforced today by both the ACC and Justice Minister Jason Clare. New Eagle Sharrod Wellingham will miss the rest of the #NABCup and may struggle for Round 1 after injuring his ankle in a trampoline mishap.